Though a smaller producer than its neighbour, Australia, New Zealand has had no less an impact on the wine world with its superbly crafted, quality wines. The modern wine industry of New Zealand is still considered to be in its infancy, yet it has achieved a worldwide renown out of all proportion to both its size and its maturity. With the slogan 'The Home of Cool-Climate Wines", New Zealand's wines have established a style and a character that are immediately both memorable and popular. They are crisp and fruity, balancing acidity and concentrated flavours, and eschewing the fullness of Australian wines in favour of elegance and poise. Not surprisingly, New Zealand has export customers throughout Europe, the Americas and the Far East. The style is epitomized by two white wine styles that have captured the imagination of wine lovers around the world. The first is based on Sauvignon Blanc, the white grape renowned in the Sancerre and Pouilly-Fume wines of France, which in New Zealand has achieved new heights of intensity and a superb fruit flavour. The second is made from Chardonnay, another grape variety that in New Zealand has a delicious natural acidity that is balanced by a honeyed malolactic fermentation, the use of new wood and, again, excellent fruit quality. To these two can soon be added another distinctive style that is coming up fast, based on blends of red grape varieties - Cabernet Sauvignon with a little Merlot - and producing wines with the sort of elegance that is more often associated with Bordeaux. Latitudinally, one would expect New Zealand to have a hot climate - rather like that of the Spanish vineyards. In reality, the country's isolated position in the southern Pacific Ocean gives it changeable weather patterns, with strong, often cold southerly winds blowing from the Antarctic. 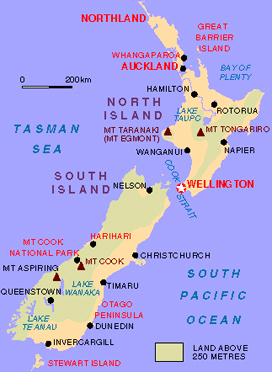 The Northland region at the northern tip of North Island is, in fact, semi-tropical, while the far south of South Island, around Dunedin and Invercargill, can experience bitterly cold winters and only cool summers. Vineyard areas are found on both islands between these two climatic extremes. Those of Auckland are now in decline, but new plantings continue at a pace from Northland to Otago on South Island, though they tend to be concentrated in the more temperate belt from Gisborne and Hawke's Bay in central North Island to Marlborough in the north of South Island.